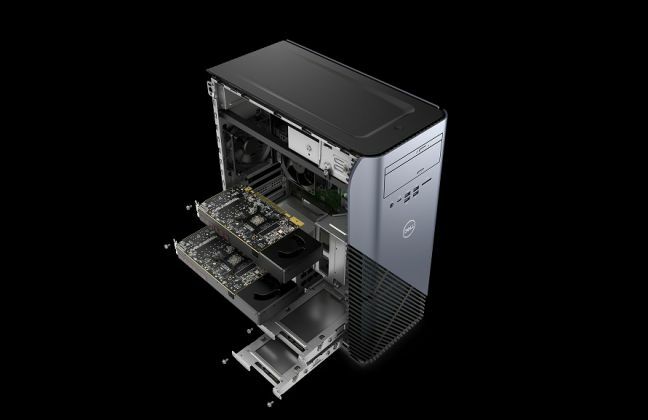 Today at Computex 2017, Dell announced today its first-ever Inspiron Gaming desktop. The new Gaming desktop is powered by latest AMD Ryzen processors. AMD Ryzen processors feature SenseMI, which optimizes power consumption, task routing, and clock speeds to deliver exceptional responsiveness and performance whether it’s gaming, Virtual Reality or streaming. Gaming-focused design touches with functional venting, thermally-optimized airflow routing, available Polar Blue LED Illumination, and easy component access. Up to 850 watts power supply options for supporting dual discrete graphics. VR Ready that supports HTC and Oculus. A wide selection of high-capacity hard drives with responsive SSD and dual-drive options plus up to five bays for future storage upgrades. The new Dell Inspiron Gaming desktop will be available in for $599.99.